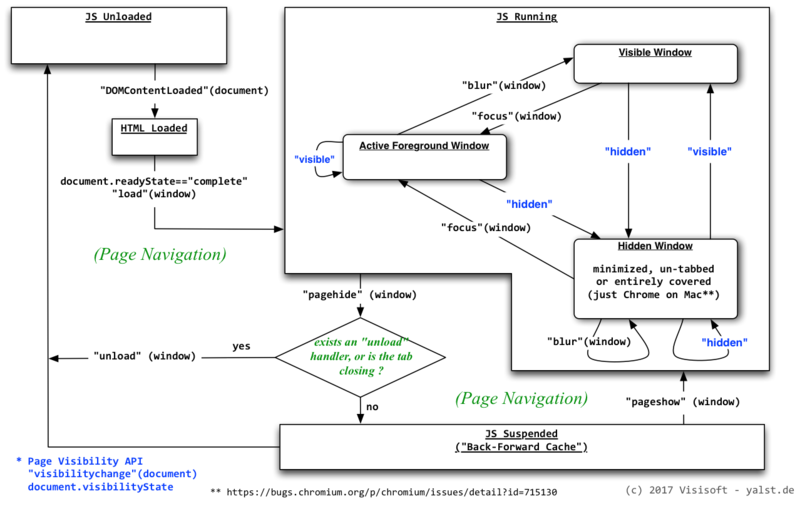 This diagram tries to connect the various DOM events with the visual and executing state of a web page. The events are displayed as „quoted text“, while the event targets are (parenthesised). In his blog post Don’t lose user and app state, use Page Visibility Ilya Grigorik, a Google engineer, recommends using the Page Visibility API events („hidden“ and „visible“ arrows in my diagram) to decide putting the app into the background and out again. As you can see in reality this is not quite so simple, since the visibilityChange events fire not always reliably. On page unload AJAX network requests are sent by all browsers if – contrary to the general advice – the synchronous flavour of XMLHttpRequest (SJAX) is used. When implementing a web page like the yalst operator console which monitors frequently changing data the most reliable and most compatible method is still rapidly polling of Ajax requests. A number of websocket implementations use Ajax polling as a fallback in case the web socket connection can not be established. Both the issuing of Ajax requests and periodically executing a worker function are common tasks when building web applications and are abstracted in many library implementations. A Promise-based interface provides a nice way to decouple the asynchronous internals of the network operation from the application program flow. A general description is that a promise encapsulates the final result of an asynchronous operation. A promise may be in one of the three states, "pending", "resolved", and "rejected". The promise itself accepts callbacks via its then method. Which means that instead of specifying callback functions in the call of an asynchronous operation that operation simply returns a promise (so to speak a „promise“ of its eventual result). Time sequence of asynchronous I/O using a promise object to wrap the results. The gray box groups an alternative line of execution. . The combined promise all which resolves not until all given promises resolve (e.g. loading a bunch of images before displaying the slide show). 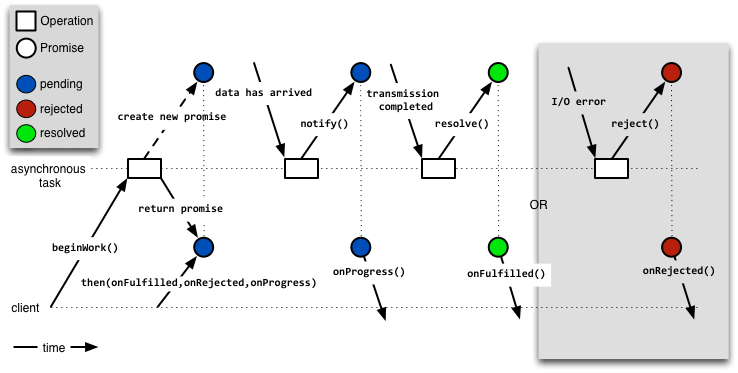 The propagation/forwarding of promises by returning a new promise from a then callback. E.g. when polling Ajax in case the reason for an Ajax failure was a timeout condition the onRejected() handler could resolve a newly created promise with a default value an return that promise. Thus the poll control loop is not interrupted. Another advantage is that sequential chains of asynchronous logic actually appear sequential with promises rather than with the unwieldy nesting patterns of callback functions . Usually the first candidate for a library implementation is always the well-established jQuery library. Fortunately it’s Ajax objects already implement a promise interface, well done! However to repeatedly poll a worker promise neither jQuery nor underscore i.e.Low-Dash provide suitable methods. which is an excellent choice for wrapping the jQuery Ajax worker function for our purpose. However since there are two different promises involved now the program flow can get confusing. In order to clarify their dependence the next digram depicts all possible outcomes of this combination. Due to this article’s format the time axis is rotated pointing from top to bottom. Using when.js poll method with a worker function returning a jQuery promise. The gray boxes group alternative lines of execution. Please feel free to verify his behaviour in this JsFiddle. As „promised“ here is the final code which defines the monitoring loop in the yalst operator console. sowie an eingetragene Vereine und Verbände gerichtet. Diese Website benutzt ein cookiebasiertes Besuchertracking für eine anonymisierte Nutzungsstatistik und zur Unterstützung unserer Agenten bei Chatanfragen.